Is it Christmas now? Is it…now? Is it…now?! Not that I’m excited this year! No, not me. I think that being healthy for the first time in years is helping with the excitement. I have no painkillers taking the edge off, we have an advent calendar for the first time in a while and I’m really enjoying shopping for and making gifts. Hooray! 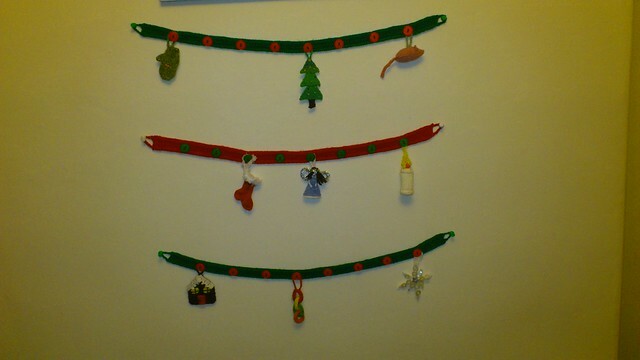 That’s my advent garland with nine – yes, nine – decorations so far. Every one has been completed on the day, some just minutes before bedtime, but in time nonetheless. Every one is my favourite for just a day, until the next one comes along. Some are simple, some are complicated, all are lovely. 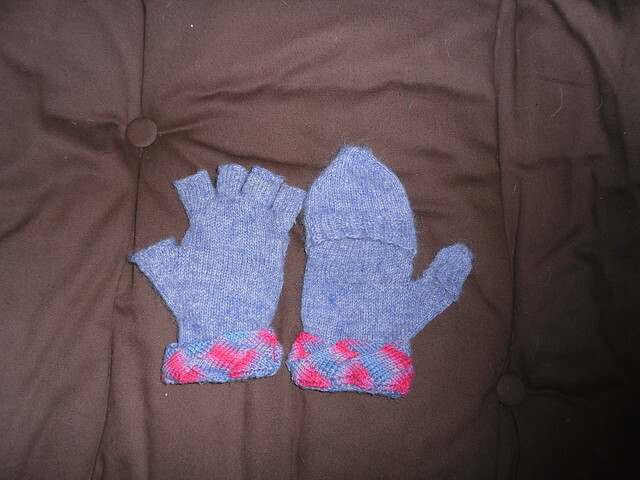 On the left is the converted fingerless view, on the right the flap-over mitten version. They are great for walking the dog, especially the bit where I have to clean up after her. Originally, I made these gloves a couple of years ago and wore them until they had holes in the fingers and thumbs – about two winters in total. When I found them languishing in the bottom of the winter woollies drawer a few weeks ago and couldn’t bring myself to throw them away, A’s Mum suggested making them fingerless and the idea just took off from there. I’m really happy with them. Anyway, this week has been another busy one, with hospital visits (with Mum), dentist appointment, lots of work stuff and more planning for xmas. I have now chosen/ordered all of my own xmas presents, and received most of them already too. A has done the same for his. Although we don’t actually get the goodies until xmas day, we won’t bother with wrapping them up as we know what they are, but I might get a couple of large gift bags to put everything in anyway. Last weekend with Gethin was fun. He came straight in, marched past me and A, to say hello to Muffin. That was the start of it, and from then on he was only really interested in the dog. She even got all the goodnight kisses, there was not even one to spare for me! The Dude is staying over again on Friday, as David and Sam are going out for a work do, so I’ll have the fun of getting him and Muffin up at the same time on my own on Saturday morning when A is working. This week coming, I’m hoping to catch up with a friend on Monday. Bristol Tuesday and Wednesday. Mum’s leaving do at work on Thursday – she’s worked at the same place for 26 years, and I worked there too for a while. Gethin overnight Friday. Catching up with another friend on Saturday and dinner at Alan and Kat’s on Saturday night. I’m running out of time for things like housework, putting up xmas decorations and chilling out! This entry was posted on December 10, 2011 at 11:32 am and is filed under knitting. You can follow any responses to this entry through the RSS 2.0 feed. You can leave a response, or trackback from your own site.